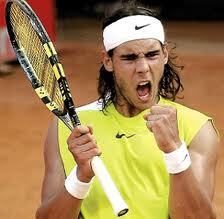 Second seed Rafael Nadal overwhelmed Andy Roddick from the the start winning 6-2 6-1 6-3 on Friday at the U.S. Open. Nadal took the first four games in 18 minutes. He then reeled off 16 of the last 17 points, including 12 in a row to close the second set. The 10-time grand slam winner powered 35 winners past the hapless Roddick including 22 forehand winners. The American managed only one backhand winner and none from the forehand side in the match. Seeking his 11th Grand Slam title, Nadal has yet to drop a set heading into Saturday’s semifinal against No. 4 Andy Murray, who beat No. 28 John Isner 7-5, 6-4, 3-6, 7-6 (2) earlier Friday. The other semifinal was set up by Thursday’s quarterfinals, and it’ll be a big one: No. 1 Novak Djokovic against No. 3 Roger Federer, who has won five of his record 16 Grand Slam championships at the U.S. Open.